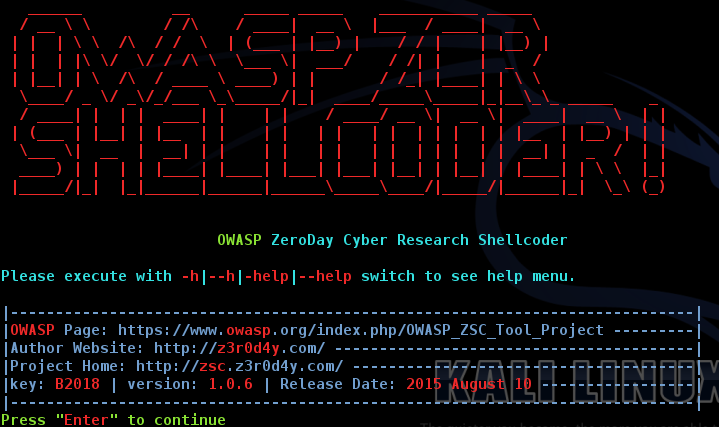 OWASP ZSC is an open source software in python language which lets you generate customized shellcodes for listed operation systems. This software can be run on Windows/Linux&Unix/OSX and others OS under python 2.7.x. Shellcodesare small codes in assembly which could be use as the payload in software exploiting. Other usages are in malwares, bypassing antiviruses, obfuscated codes and etc. According to other shellcode generators same as metasploit tools and etc, OWASP ZSC using new encodes and methods which antiviruses won't detect. OWASP ZSC encoderes are able to generate shellcodes with random encodes and that's lets you to get thousands new dynamic shellcodes with same job in just a second,that means you will not get a same code if you use random encodes with same commands, And that make OWASP ZSC one of the bests! otherwise it's gonna generate shellcodes for many operation systems in next versions. -job => what shellcode gonna do for you ? -about => about software and developers. With these switch you can see the oslist,encode types and functions [joblist] to generate your shellcode. Now you are able to choose your operation system, function, and encode to generate your shellcode, But all of these features are not activated yet, so you have to look up this table HERE to see what features are activated. For example, this part of table telling us all functions for linux_x86 is activated, But Encodes [xor_random, xor_yourvalue, add_random, add_yourvalue, sub_random, sub_yourvalue, inc, inc_timesyouwant, dec, dec_timesyouwant] are just activated for chmod() function. Note: Don’t use space ‘ ’ in system() function, replace it with “[space]” , software will detect and replace “ ” for you in shellcode. Note: script_executor(),download_execute(),download(),dir_create(),file_create() are using linux command line , not the function. [wget,mkdir,echo] system() function added in script, you can use it to do anything and generate any command line shellcode. Note: each time you execute chmod()[or any other] function with random encode, you are gonna get random outputs and different shellcode. Note: your xor value could be anything. “xor_0x41414141” and “xor_0x45872f4d” are examples. With -wizard switch you are able to generate shellcode without long ARGVs, software will ask you for information. Note: While you are using -wizard switch, if you push “Enter” without typing anything, the default value will be set on the varible. Note: With entering “list”, List of values will be shown. fixed bug in encoding module not available. system() function added in script, you can use it to do anything and generate any command line shellcode.